Will this new take on Sherlock Holmes, Elementary, be a ratings success and renewed for a second season — or will it be cancelled, like so many other newbie shows? Elementary typically airs on Thursday nights at 10pm on CBS. The show stars Jonny Lee Miller, Lucy Liu, Aidan Quinn, and Jon Michael Hill. Below are the TV show’s ratings for the 2012-13 season, the best way to tell if Elementary will be cancelled or renewed for season two. Final season averages: 2.3 rating in the 18-49 demographic with 10.65 million total viewers. 2.0 in the demo (+5% change) with 8.98 million (-3% change). Season averages: 2.26 in the demo with 10.65 million. 1.9 in the demo (-5% change) with 9.29 million (-5% change). Season averages: 2.29 in the demo with 10.80 million. 2.0 in the demo (0% change) with 9.75 million (-3% change). Season averages: 2.31 in the demo with 10.88 million. 2.0 in the demo (-5% change) with 10.07 million (-4% change). Season averages: 2.32 in the demo with 10.94 million. 2.1 in the demo (-9% change) with 10.48 million (-8% change). Season averages: 2.34 in the demo with 10.99 million. UPDATE: Elementary has been renewed for a second season by CBS. 2.3 in the demo (-4% change) with 11.33 million (+1% change). Season averages: 2.35 in the demo with 11.02 million. 2.4 in the demo (+4% change) with 11.19 million (+2% change). Season averages: 2.36 in the demo with 11.00 million. 2.3 in the demo (+5% change) with 10.98 million (+1% change). Season averages: 2.35 in the demo with 10.98 million. 2.2 in the demo (0% change) with 10.84 million (-1% change). Season averages: 2.36 in the demo with 10.98 million. 2.2 in the demo (-8% change) with 10.90 million (-5% change). Season averages: 2.37 in the demo with 11.00 million. 2.4 in the demo (-8% change) with 11.48 million (0% change). Season averages: 2.38 in the demo with 11.00 million. 2.6 in the demo (+13% change) with 11.44 million (+9% change). Season averages: 2.38 in the demo with 10.96 million. 2.3 in the demo (+10% change) with 10.46 million (+2% change). 2.1 in the demo (-5% change) with 10.31 million (-1% change). Season averages: 2.37 in the demo with 10.96 million. 2.2 in the demo (-4% change) with 10.46 million (-3% change). Season averages: 2.40 in the demo with 11.05 million. 2.3 in the demo (+5% change) with 10.75 million (-1% change). Season averages: 2.43 in the demo with 11.13 million. UPDATE: CBS has ordered two additional episodes, bringing the season total to 24 installments. 2.2 in the demo (-8% change) with 10.90 million (+4% change). Season averages: 2.45 in the demo with 11.19 million. 2.4 in the demo (+9% change) with 10.49 million (+2% change). Season averages: 2.50 in the demo with 11.25 million. 2.2 in the demo (-4% change) with 10.31 million (-6% change). Season averages: 2.52 in the demo with 11.44 million. UPDATE: CBS has ordered nine additional episodes, bringing the season total to 22. 2.3 in the demo (-8% change) with 10.91 million (-2% change). Season averages: 2.63 in the demo with 11.82 million. 2.5 in the demo (-19% change) with 11.13 million (-17% change). Season averages: 2.80 in the demo with 12.27 million. 3.1 rating in the 18-49 demographic with 13.41 million total viewers. Season averages: 3.10 in the demo with 13.41 million. This was a positive start for the new series, particularly in viewership, but the demo could have been stronger — especially considering the fairly lackluster competition (Scandal on ABC and Rock Center with Brian Williams on NBC). Compared to the season premiere of The Mentalist a year ago, CBS was up by 10% in the demo (vs a 2.8 rating) and down by 1% in viewers (vs 13.56 million). What do you think? Do you like the Elementary TV series? Do you think it should be cancelled or be renewed for a second season? I was deeply surprised to like this show because I LOVE the BBC’s version of Sherlock with Martin Freeman and Benedict Cumberbatch. Of the two, Sherlock is superior to Elementary, but Elementary has been a wonderful suprise. Like this show very much. Although I cannot watch it on Thursday nights, so watch later. 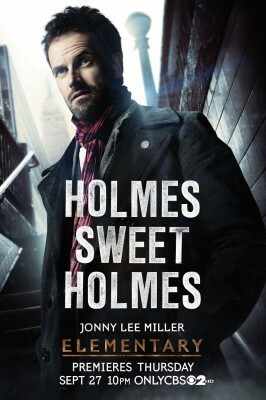 Love the characters and find the story lines interesting.. Holmes is quirky and a pleasure to watch. I love the show, but my husband doesn’t because he can’t understand Jonny Miller’s accent. It is a little nasal, but I’ve learned to understand him. Anyway, I record it and watch it later. I love Lucy Liu. I hope the writers don’t develop sexual tension between them. I like it when they are really good friends who work well together. It ruined Castle for me when the tension turned into a sexual relationship. BEST TV show ever!! I seriously look so forward to Thursday nites! Miller is amazing in his character. I wasn’t really sure about Liu at first but she has proven me wrong. They both play so well off each other. They would be crazy to take this show off the air. I LOVE this series and I hope to have a second season!!! LOVE this show too, do any of you guys know when the new episodes are airing and whn the new season is coming out? The show returns tonight at 10, still season 1. And season 2 will be coming back after the summer, in September. The finale for season 1 will air in May. Please don’t cancel, this is my favorite show. The script and the acting is the freshest thing on TV. PLEASE PLEASE PLEASE CONTINUE!!! LOVE THE SHOW! LOVE this show!! Aside from ncis, it’s the only one i make sure i watch! I love the show! Best thing on tv. Please do not cancel. Love love love it!